The hottest topic in coaching circles right now is whether we should be swinging up or swinging down. Swinging down tends to be touted by the old school folks: “Swinging down creates backspin.” “That’s what I was taught and that’s what has worked great for forever”. When you hear successful big leaguers take a side one way or the other, it is hard to know which way is right. As you can see here, a strong case is made for the need to swing at an upward plane. Mike Schmidt said the key to being a successful hitter is the quality of your “mis-hits”. If you could just perfectly time every pitch and hit it squarely then nothing else mechanically really matters. Of course, baseball doesn’t work that way. So by having the barrel in the zone early (a low position) and keeping it on the pitch plane even after contact (a higher position) you give yourself of catching the barrel on any pitch, whether you’re early or late. So is that a mic drop for the swinging up believers? Ummm, okay…..so what do we do now? The problem is, is they’re not talking about the same thing. Swinging down is in reference more to the hands. 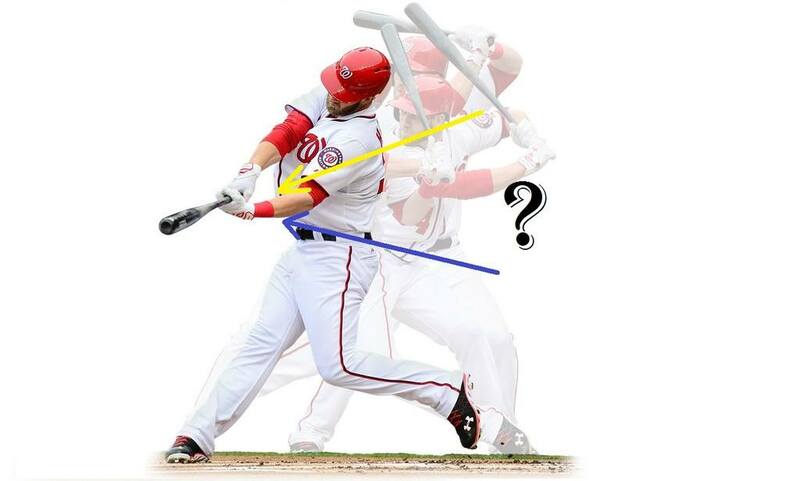 If you were to take a dry swing without a bat, your hands would be just about near your shoulder when you stride, and then about at your waist at contact….clearly that is swinging down! But the swinging up truthers actually are referring to the barrel of the bat. For good hitters, the barrel reaches it’s lowest point about where the bat is at the back foot/hip area, and from there it travels upward to the point of contact. So the hands are going down but the barrel is going up! That means everyone is arguing over the same swing. Now, you’re probably wondering – what’s the point here if it is just semantics. Well here’s the way I see it, when we take either approach as being the absolute truth we can cause some major problems. The key balance that we’re trying to find is to get “on plane” with the pitch. You can get off plane by swinging downward (like the dude at the end of the first video) but you can also get off plane by swinging too upward. It’s just like Chipper said in the second video, when guys dip the back shoulder looking to lift the ball their swings get ruined. Unless their timing is perfect they will miss or foul back. I believe that hitting downward is a good *mental* cue, because if the hands drop or get loopy at all you’re going to be WAY underneath on any sort of velocity. So that’s the truth, the bat needs to be swinging upward while the hands are moving down, but don’t over exaggerate either. One final note, another debate that is brewing that’s closely related to this topic hitting more fly balls vs ground balls. Kris Bryant famously spends much of his time in the cage looking to hit balls off the top of the next. Now HERE is where it gets dangerous. Advanced analytics are showing that hitting more flyballs/line drives is producing more success than groundball/linedrive approach. So….Kris Bryant is a freakazoid. Kris Bryant teaching you how to hit home runs is probably a lot like Shaq teaching you how to dunk. We’re just not working with the same tools here. Same goes for a lot of the guys in the big leagues who are adopting a more fly ball approach. These guys are tremendous athletes and very strong. Should a young kid start hitting more fly balls because that’s what the big leaguers are doing? I think you get my point. Go ahead and hit all the fly balls your heart desires, it’s your career and I hope it works out for you. Just be very mindful that a power approach for a non power hitter can be the recipe for a whole lotttttt of outs. So what do you think, is the swinging up vs down argument settled? I’d love to get your take, leave a comment below. Getting clear on this should help teach the young’uns how to swing like a big leaguer. Easy to get carried away on Down vs Up and mess a kid all up. I’ll have to look up Epstein. Thanks! This is one of the best articles I’ve ever read on the subject! I’ve read the Mike Schmidt Study and he makes reference to actually chopping down as I can only interpret that it would look like the last kid in the first video. There are also colleges teaching that style. What’s your thoughts on this? Is he saying the same thing Chipper is? I honestly don’t think that swings look a lot different today (from guys who talk about swinging up) vs guys who used to play who talk about swinging down. Just looks so similar. I think down is a mental cue and focused on the hands, but the barrel still moves upward the last foot or two before contact. It’s up and down!! We’re just talking about it different….that’s my take. BUT, hitting more fly balls is definitely a current trend, but that’s a different topic. 7U Travel Baseball – This will be great….right? © 2018 by Baseball Notes.